The Basilica Minore of Our Lady of Piat is a major pilgrimage site of Cagayan Valley. I've been to Cagayan Valley several times but not to Piat since it's quite a distance from Tuguegarao City, 41 kilometers to be exact. So when I found out we were visiting during this trip, I immediately obliged. Every June and July, Piat comes alive with two festivals. From June 23 to 30, the Piat Sambali Festival is held, centered on the sambali, a war dance of the tribes that were united and converted to Christianity through the intercession of the Nuestra Senora de Piat. The festivities don't stop since on July 1 and 2, the feast of Nuestra Señora de Piat is celebrated. The venerated image is erroneously referred to as Our Lady of the Most Holy Rosary (that was the original title) when it is in fact the Nuestra Señora de Visitacion (Our Lady of the Visitation). 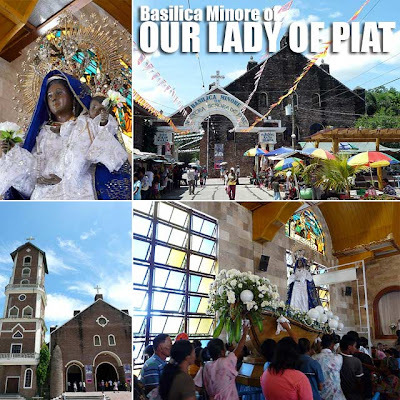 The Church of Piat became the Basilica Minore of Our Lady of Piat in 1997. Outside the church is one big flea market where you can find rows of stalls and vendors selling religious images, tobacco and native kakanin among other items you can find in the usual provincial tiangge. 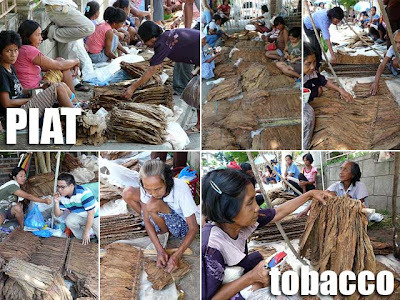 You don't see tobacco sold in Manila that way. They're usually in reams, flip top packs or sold by the stick. Don't worry, I still don't smoke. I just wanted to try the tobacco for the fun of it. The Piat Basilica is actually a great place to sample the local delicacies. 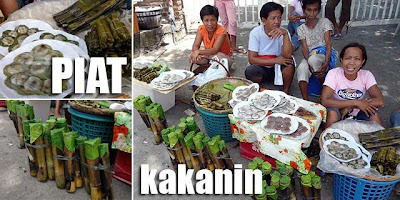 Of all the kakanin they sold in the area, the best is the pawa, a kakanin made from ground sticky rice with sweetened ground peanut filling inside. While most vendors sell it for PHP20, I was not quite satisfied with them since they were not freshly-cooked. Later did I find out that the pawa sold in the Piat Basilica are of varying quality. There are some which make it really good and I recommend V. C. Pasinca's Pawa. A pack of this yummy treat costs PHP25. Make sure you also buy it warm to ensure the same heavenly experience I had munching on them. Hi! I've been to Piat quite a few times and have attended Sunday mass there. However, since it's always full packed you have to go early to be able to sit comfortably or else you'll have to stand either inside the church like sardines or outside where the solemnity of the mass is lost. Anyway, I also like the "pawa" that you mentioned. I think it's the same as the "masi" that I tasted in Cebu. I remember that they sold it there just like how "taho" is sold here -- in the tin cans "na nilalako". i have fond memories of piat with friends, we used to go on a pilgrimage there after major exams for divine assistance. hehe. it was there that i first tasted "igado." never been there during its official feast days, though. I WAS BORN AND RAISE IN PIAT,GRADUATED IN 1975, I LEFT IN 1979.I WENT HOME IN 2004,AS ALWAYS RAIN IS THE NORMAL WEATHER,PEOPLE WILL SACRIFICE TO VISIT THE TOWN, THE SEE MAMA MARY,EVEN THE WEATHER IS BAD THE FAITH OF PEOPLE WILL DO ANYTHING TO ASK BLESSINGS FROM HER. i must see the beauty of cagayan, im proudly ilokano . i want to see it again after a long tym years i cant go there. I would like to visit Piat again. Is there any accommodation, hotel that we can book in? Much appreciate if someone can help in relating to this matter. Thank you kindly in advance. how can i know the sked of masses on weekdays? i want to visit OUR lADY OF pIAT on weekdays. I have visited Piat in 1983. would like to know how it is to get there from Tuguegarao? what to ride or are there shuttle buses? There are Vans going to Piat daily. Just ask the Tricycle driver to drop you at the nearest van terminal which is Ugac H-way area.